The update for this pattern is for the Lace Chart. It shows the “no stitches” for rows 2, 5, and 6. This is the 5th square of the 30 square Knitterati Afghan. The afghan commemorates Cascade Yarns® 30th anniversary. The 30 squares will be released throughout 2017 as part of the mystery knit-along. 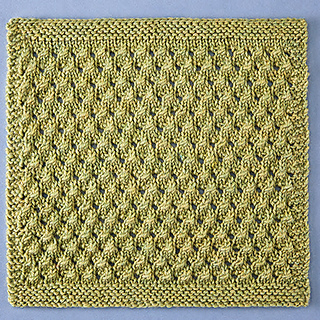 This pretty lace pattern with all over texture is fun to knit and stands out inside the garter-stitch frame. 20 sts x 32 rows = 4” (10 cm) in Lace Pattern using US 7 (4.5 mm) knitting needles.